While performing pipeline maintenance, sometimes a section of a pipe is taken out of the ground and is replaced by a new pipe. This process is known as pipe replacement. A pipe with a from measure of 0 and a to measure of 10 exists. Various line and point events are present in the pipe as shown above. During inspection, it was deduced that a section of the pipe between the measures 0 and 5 needs to be replaced on 12/31/2017, as shown below. The results of replacing the pipe and replacing the events are shown in Table 3. The event is left as is. The event is retired because it was in the retire category. The whole event is retired because it was in the retire category. A new event is created for the existing section of the pipe, keeping the dates and attribute values of the old event. The whole event is retired because it was in the retire and replace category. 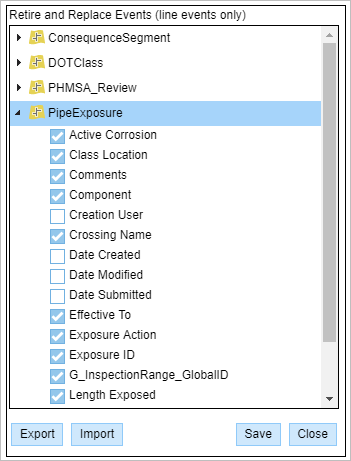 A new event is created for the existing section of the pipe, keeping the dates and attributes of the old event. 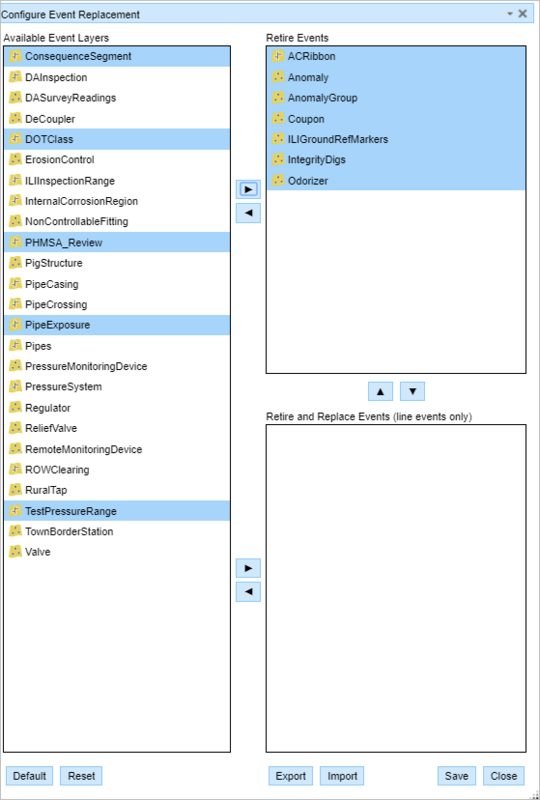 A new event is created for the new section of the pipe with the new dates and attributes provided in the Event Replacement widget. 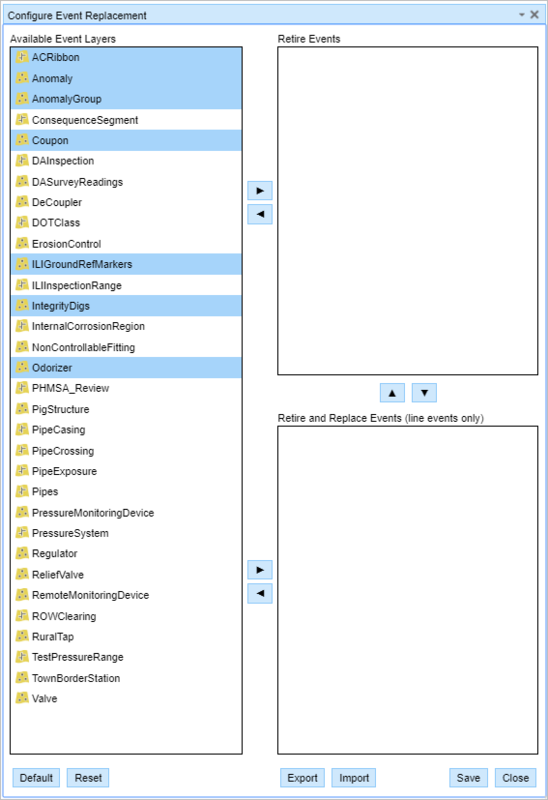 A new event gets created for the new section of the pipe with the new dates and attributes provided in the Event Replacement widget. The configuration of event replacement requires categorizing the events in the map service into three categories: As Is, Retire, and Retire and Replace. In the Edit Events group, click the Configure Event Replacement button . The Configure Event Replacement widget appears. 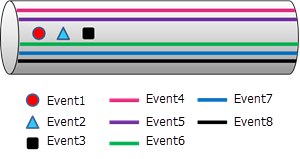 All the line events and point events available in the map service are listed in the Available Event Layers list. If a default configuration has been created, click Default to load it. Click Reset to return to the last saved configuration in the map service. Click Shift or Ctrl and click and drag multiple line events from the Available Event Layers list to the Retire Events list. You can also choose event categories and use the arrow keys to move selected line events into the lists from left to right or up and down between the Retire Events and Retire and Replace Events lists. Events placed in the Retire Events list will be retired when events in the category are replaced using the Event Replacement widget. 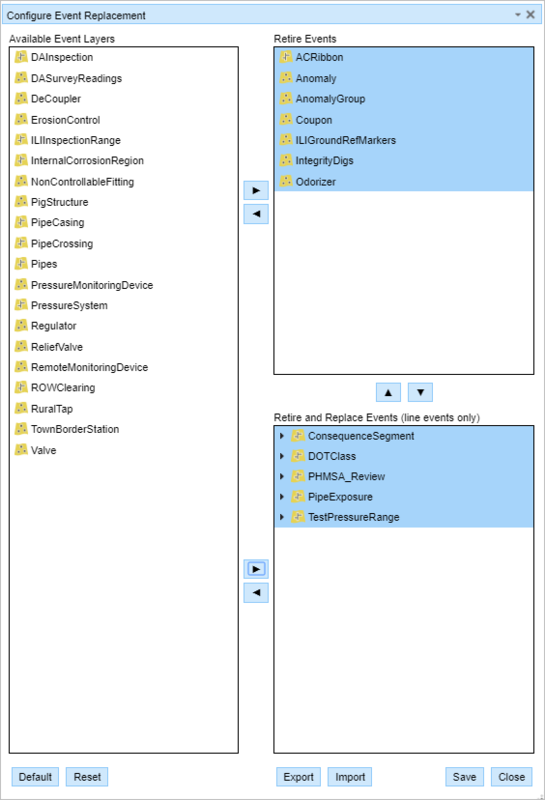 Click Shift or Ctrl and click and drag multiple line events from the Available Event Layers list to the Retire and Replace Events list. Only line events can be retired and replaced. 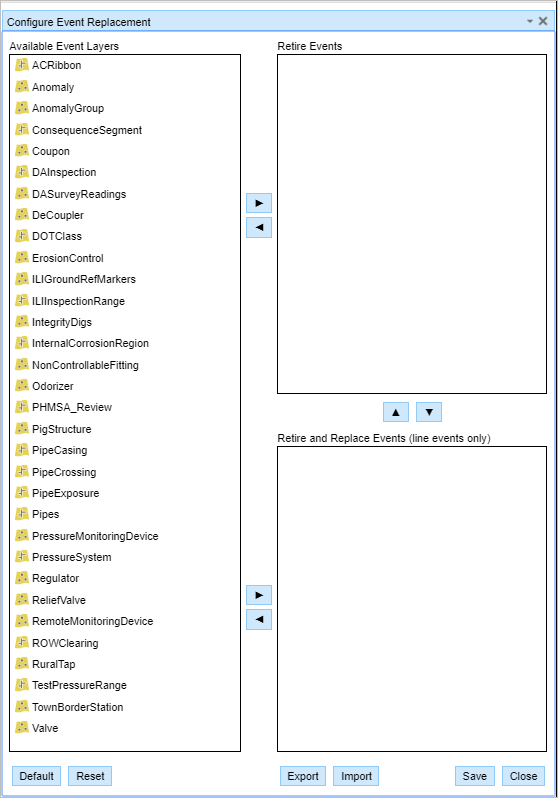 Event layers left in the Available Event Layers list are left as is. If no events are configured to retire or to retire and replace, you'll be unable to save using the Event Replacement widget. Optionally click the arrow for any event layer in the Retire and Replace Events list to expand it. An expanded list of fields in the event layer appears. You can use these check boxes to show or hide the fields when performing the event replacement operation. Some attribute fields are required fields, which is denoted by the asterisk (*) symbol. A required field is a nonnullable field with no default value. Visibility can't be changed for required fields. Click Save to save the event replacement configuration. Click Export to export the configuration to an LRER file. Give the configuration file a name such as eventplacement1.lrer. The event replacement configuration is saved in the local browser’s download folder. Copy the exported file to the Event Editor folder. Open the configuration file (config.json) in a text editor such as Notepad. For more information, see Configuring the Event Editor web application. The Default button defaults to the event replacement configuration provided in the Event Editor configuration file. The Reset button restores the last saved event replacement configuration for that browser. You can edit the default event replacement configuration and use it in your browser.